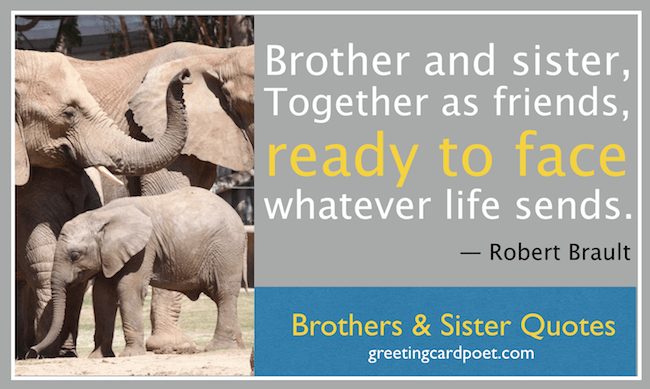 These brother and sister quotes are great for the siblings in your life. A brother and sister’s relationship is one of the purest and loveliest of all relationships. In fact, your brothers and sisters are the only ones who will be there with you throughout your life. It is a relationship of a lifetime. You will always find your siblings there next to you. There have always been funny and serious sayings about the relationship that brothers and sisters share. It is a unique relationship where there can be much love, interspersed with some challenging times. But when it comes to fighting against tough foes, brothers and sisters can be the strongest defenders for each other. A brother and sister are friends for life. Even when you spend most of your childhood fighting, you grow up into adults with the strongest relationship. Here are some beautiful brother and sister quotes to make you feel more special about this unique relationship. Sibling relationships … outlast marriages, survive the death of parents, resurface after quarrels that would sink any friendship. They flourish in a thousand incarnations of closeness and distance, warmth, loyalty and distrust. Joy and laughter or tears and strife, holding hands tightly as we dance through life. We were all just a year or two apart, and we were always so supportive of each other. I learned everything from my older brother and sister and taught it to my younger sisters. There is a little boy inside the man who is my brother. Oh, how I hated that little boy, and how I love him too. Yeah, I started when I was 6 years-old. My brother and sister would get all of these presents at Christmas time from the cast and crew of their show and I was jealous. So I decided that I had to become an actor. If you age with somebody, you go through so many roles – you’re lovers, friends, enemies, colleagues, strangers; you’re brother and sister. That’s what intimacy is, if you’re with your soul mate. I want to be alone and work until the day my heads hits the drawing table and I’m dead. Kaput. I feel very much like I want to be with my brother and sister again. They’re nowhere. I know they’re nowhere and they don’t exist, but if nowhere means that’s where they are, that’s where I want to be. your sister is your sister all your life. What brothers say to tease their sisters has nothing to do with what they really think of them. Your siblings are the only people in the world who know what it’s like to have been brought up the way you were. Sisters and brothers just happen, we don’t get to choose them, but they become one of our most cherished relationships. Sisters could do a great deal for their brothers, if they would. No life’s worth more than any other, no sister worth less than any brother. When sister and brother stand shoulder to shoulder, who stands a chance against us? I am lucky to have a brother like you. As we grew up, my brothers acted like they didn’t care, but I always knew they looked out for me and were there. My brother, someone who hides my toys & break my dolls but he picks me up whenever I fall. Someone who stands by my side and holds my hand. When things don’t go well he helps me understand. Someone who makes funny faces to see how I’d react. I love my brother & that’s a fact. We know one another’s faults, virtues, catastrophes, mortifications, triumphs, rivalries, desires, and how long we can each hang by our hands to a bar. We have been banded together under pack codes and tribal laws. I think people that have a brother or sister don’t realize how lucky they are. Sure, they fight a lot, but to know that there’s always somebody there, somebody that’s family. Tip: Use these brother and sister quotes for social media captions. Being pretty on the inside means you don’t hit your brother and you eat all your peas — that’s what my grandma taught me. Your brother is always the first male friend you will have in your life. Nobody will ever be able to understand your craziness like your brother and although you don’t see each other as much as you’d like, he will always remain your friend and be there for you when you need him the most. If you have any suggestions for our brother and sister quotes, please let us know via the contact page. Thanks.